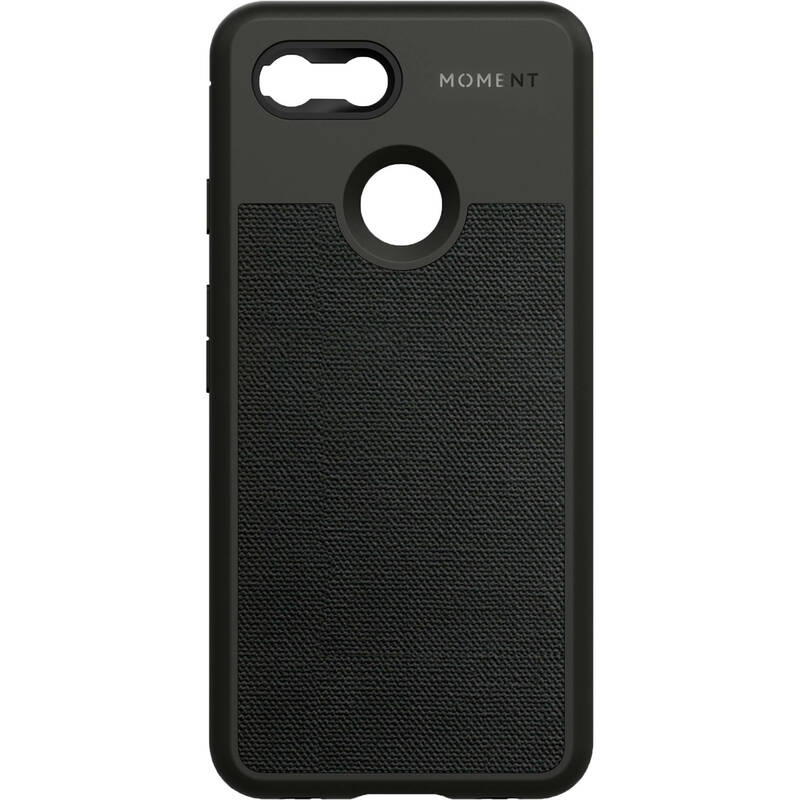 Protect your Google Pixel 3 while you shoot with the Moment Photo Case in black canvas. This case comes with the Moment lens interface built in, so you can use the current generation of Moment lenses with your device. The thin, lightweight case has a rubberized body and rounded edges to keep your device safe from scratches and bumps and is suitable for photography with the lens removed. A wrist strap attachment on the bottom gives you another carrying option. Slim and minimal, this case is suited for daily use. Wear it around your wrist or in your back pocket. Light and easy to carry with textured materials for a user-friendly grip. Fits in pockets and attaches to straps for an easy carry. This case has curved edges and a textured back for one-handed shooting. The mount interface has been improved with a fiberglass-reinforced material so it's stronger than ever before. The inner geometry of the case has been redesigned to provide additional protection against drops. The bottom face of the case is now protected, while still offering crisp sound through the stereo speakers and supporting Moment's strap attachments. The front-facing bevel is flush at the bottom to support the use of gestures on the Pixel 3. Box Dimensions (LxWxH) 7.75 x 3.75 x 0.75"
Photo Case for the Google Pixel 3 (Black Canvas) is rated 2.0 out of 5 by 1. Rated 2 out of 5 by Lawrence from Waiting for new of case correcting poor image quality The case I received in 12/2018 had the Moment lens misaligned with the Pixel camera. The resulting image with the wide angle lens was very poor image quality on the right hand 1/3 of the shot. I emailed Moment support and they acknowledged the problem. I am currently waiting for Moment to ship a new version which corrects the issue. As far as other aspects of the case, its a perfectly fine case and also slips on/off easily if you only want to use it when using the Moment lenses.